If generosity played a part in the golf swing, then Ian Baker-Finch would probably boast at least 10 majors. The former Open champion has sold/donated his Gold Medal from his 1991 win at Royal Birkdale so that he could support not one, but three worthy causes. It has now been revealed that IBF’s medal will be showcased alongside other precious memorabilia from the 10 Championships played at Royal Birkdale. 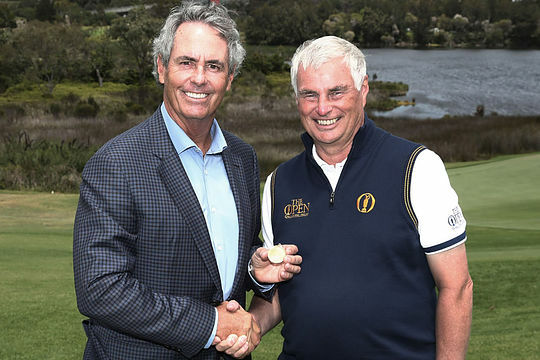 The R&A gave Baker-Finch $US50,000 for the medal and the popular Queenslander then topped up that figure so that he could give $25,000 each to Challenge and Redkite in Australia. He also gave $15,000 to the Golf Foundation in the UK to support its ‘Girls Golf Rocks’ participation program. “Many of my charitable activities have focused upon improving the lives of young people and particularly those who are undergoing care and treatment for cancer-related illnesses in Australia,” Baker-Finch said. R&A chief executive Martin Slumbers said they were only too happy to support the Australia’s generosity. “One of Ian’s most enduring qualities is his unstinting acts of kindness and we were delighted to support these charitable activities which clearly mean a lot to him,” Slumbers said. Challenge is a Melbourne-based charity that provides support services to young people diagnosed with cancer and their families and has been in operation since 1983. Australian golfer Jarrod Lyle, a close friend of Baker-Finch who passed away earlier this year after a third fight with leukaemia, was an ambassador for Challenge and supported its work for many years. Redkite was founded as The Malcolm Sargent Cancer Fund for Children in Australia in 1983 and provides essential support to children, teenagers and young adults with cancer to ensure the best possible quality of life for them and their families. Could you play ten rounds in 24 hours?